Tronsmart Draco AW80 is one of the most powerful ARM mini PC on the market thanks to Allwinner A80 octa core processor, and the company also released an early Linux (Ubuntu) image at the end of last year. However, this firmware could not support hardware video decoding nor 2D/3D graphics acceleration. Since then progress has been made, and Tronsmart has just released an image with hardware video decoding. There’s still some work to be done as 4K and H.265 are not supported, and support for Kodi also needs to be implemented. At least for now you should be able to play 1080p video with VLC without issues, and the company also claims online video will play without lags. 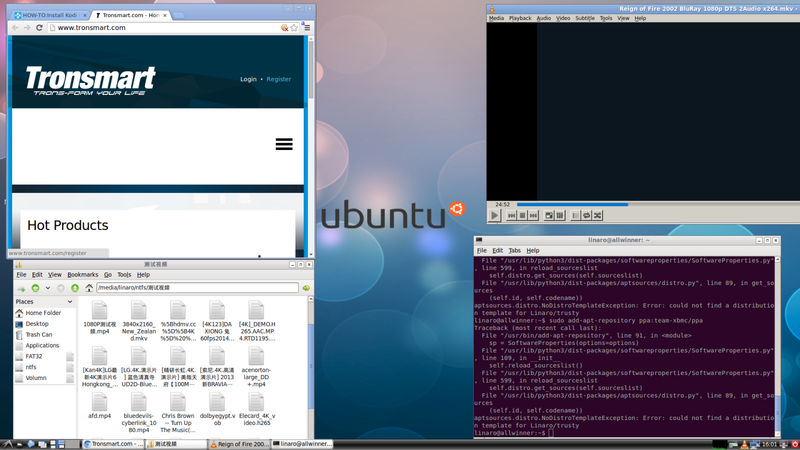 If you’d like to give it a try, download and extract Draco_AW80_Ubuntu_20150204.zip. Then follow Allwinner A80 firmware upgrade instructions with PhoenixSuit (Windows) or LiveSuit (Linux) firmware tool to complete the process. You need to connect a USB cable cable between the USB 3.0 OTG port of Draco AW80 and your PC, hold the Fn button on the bottom of the enclosure, and connect the power so that it enters FEL mode and be detected by the firmware tool. too bad is not possible to burn this as startup sd card and run it as live OS without install. But soon there will be images based on debian and ubuntu for cubie board 4 or other A80 devices. Which API does it use for hardware video decoding acceleration? VAAPI, VDPAU, YAMI, or OpenMAX IL, or a other propitiatory API? I’m working on another sd card image right now. I’ll probably get it uploaded tomorrow. I did the same thing with the last lubuntu release for the Draco. With some images you can burn it in “Startup” mode and it will install to the microsd instead of using the microsd to flash the internal drive. For some reason it doesn’t work with the linux release, but it can be worked around. Is the Draco the best box out in your opinion?? I’m looking to get one soon and would like one of the better ones. It’s probably the fastest box I own. I’m not sure what the best box is. I managed to get this Lubuntu release burned to a 16GB sdcard in “Startup” mode. I made a dd backup of the card and uploaded it for anyone that wants to try this without replacing Android. 18:42:08 T:3033800704 ERROR: Previous line repeats 60 times. 18:42:08 T:3033800704 ERROR: EGL/GLX Error: vInfo is NULL! XBMC/Kodi will fail to run on most (all?) ARM platforms if you install it with apt-get. Currently the hardware video decoding only works with VideoLAN, and there would need to be a specific version of Kodi or OpenELEC to run on Draco AW80. Have you read that I’ve compile Kodi on this board (draco/AW80) ? I’m also running Kodi on the standard Android OS that Tronsmart provide without any problem. My understanding is that this new Lubuntu has libraries for the Draco graphic accelarator hardware. You’d need to port or find a port of Kodi Linux hat runs on Allwinner A80. I have a Tronsmart Draco AW80 media box currently running the latest (14.04) Lubuntu image from the Tronsmart site. Has anyone (Tronsmart, Allwinner, sunXI) released the SDK/source that would enable me to compile my own Linux kernel for this box? Either for 14.04 or a newer Linux distro?